Don’t you wish you had the luck of the Irish right before Christmas? Well, Sloto’Cash makes it happen for you when you deposit as little as $35 and play our new slot machine game Lucky 6 with a 111% Match + 33 Free Spins! This charming 6 reel slot features four leaf clovers, mischievous bunnies, mushrooms, gold rings, leprechauns and more! Tons of winning opportunities take place with lines 1-5 paying left to right and lines 6-10 paying right to left! 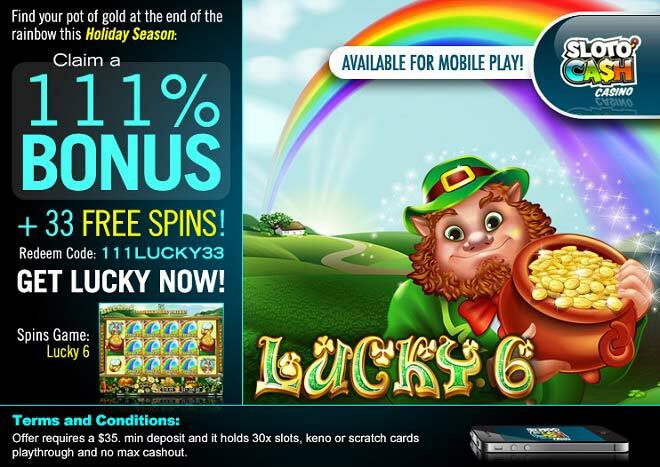 Chase even more gold at the end of your rainbow this holiday season and beyond when you play Lucky 6! Trigger the Free Spins round when landing four or more scattered Lucky 6 letters with added bonuses if these land on the same line. More luck comes your way with Grouped Wilds, Extra Wilds, Wild Reels and all wins multiplied times 5!